Progesterone has been a hot topic lately with my clients and podcast listeners. I recently released a podcast interview with Dr. Nora Pope a local Toronto Naturopath and Fertility Awareness Educator, and in our episode we delved into the important role progesterone plays in fertility. The first thing to know about progesterone is that you only make it when you ovulate. When you’re on the pill your body isn’t making natural progesterone in any significant quantities. If you aren’t menstruating (and you’re not pregnant), then you’re not making any. The second thing to know about progesterone is that it is absolutely required not only for you to conceive, but for your body to sustain your pregnancy full term. If your body isn’t making enough progesterone you’re much more likely not to conceive in the first place, and have a miscarriage early on. The third thing you need to know about progesterone is that progesterone plays an important role in developing the uterine lining so that it is ready and able to sustain the life of a fertilized egg. During the first half of your cycle estrogen stimulates the lining of the uterus to grow, but that leaves the job only half finished. In the second half of your cycle after you ovulate, your progesterone levels shoot up and help the uterine lining to mature. Progesterone stimulates the uterine lining to secrete important nutrients that are necessary to support the life of a growing embryo. When you’re not making enough progesterone your uterine lining isn’t able to finish maturing, and that means that it’s not a nice place for your tiny fertilized egg to nestle into. You can think of your uterus like your bed, and progesterone as the fluffy warm comforter. Without the comforter the egg won’t be able to nestle in and implant in the uterine wall. How do I know if my progesterone levels are low? That’s where fertility awareness charting comes in. If you’re new to Fertility Awareness, make sure to check out this post for an overview of the basics. Fertility Awareness cycle charting allows you to record the important events that happen during your menstrual cycle, and gain invaluable information about whether your cycle is normal or not. One is the length of your luteal phase. The luteal phase, or post-ovulatory phase, is the number of days between your confirmed date of ovulation and the first day of your next period. If your cycles are healthy you can expect your luteal phase to be between 12-14 days. If you’ve recently come off hormonal contraceptives however, please keep in mind that it can take anywhere from 3-9 months (and in some cases 12 months to 2 years) for your cycle parameters to fall within normal ranges — especially if you aren’t getting the support you need to improve your menstrual cycle health naturally. If you notice that your luteal phase is less than 10 days on a regular basis then that is a huge flag that your progesterone levels are probably low. Another indication is premenstrual spotting. If you’ve noticed that you have some degree of light spotting for several days before your next period starts that is another huge flag. I think my progesterone might be low, how do I test it to confirm? This next section is the most important in this post. You can only accurately test your progesterone levels after ovulation. If you haven’t confirmed that you have ovulated the test is 100% useless. The problem lies when your doctor sends you for a 21 day progesterone test. The whole concept of a 21 day test is based on the assumption that every woman alive ovulates on day 14. Since most women don’t ovulate on day 14 every single cycle (or ever), choosing an arbitrary day to test every woman’s progesterone makes absolutely no sense. Again, this is where fertility awareness charting comes in. The day 21 progesterone test is trying to test a woman’s level of progesterone in the middle of her luteal phase, or 7 days after ovulation. In order to assure that this test is done at the correct time in your cycle you need to first confirm ovulation. Taking your basal body temperature each morning before you get out of bed is the most accurate measure of ovulation (second to having a daily ultrasound of your ovaries). Once you see a sustained increase in your waking temperatures you have confirmed ovulation. You can then arrange to have your progesterone test done on the 7th day after your temperature went up. A little heads up though. Most doctors are so set in their understanding of the 28 day model of a woman’s menstrual cycle that explaining this to them will be like banging your head on a wall over and over again. No matter how many times you try to explain it, or even if you bring in your charts and show your doctor, you’ll be told to come in on day 21 of your cycle. You might have to massage the truth a little (i.e. say it’s day 21 even if it isn’t), but make sure you get that test done on the correct day of your cycle. If you track your cycles and find that you ovulate on day 19 for instance, then taking your progesterone levels on day 21 will show that you have low progesterone, but your progesterone might not even be low. 7 days after ovulation in this case brings us to day 26. A blood draw on day 26 would give you an accurate measure of your progesterone levels in this example. After confirming that you ovulated on day 19, you’d have to be tested on day 26 in order to get an accurate reading of your progesterone levels. Can I improve my progesterone levels naturally? The short answer is yes! There are a number of things you can do to improve your hormone levels naturally, but if this is the part where you expect me to give you a magic list of supplements that will fix your cycles quickly and easily, I’m about to disappoint you. Your cycles are a reflection of your overall health and fertility. Healing your cycles starts with your diet, your lifestyle, your sleep habits, your gut health, and much more. It starts with making sure your body is getting enough nutrition to rebuild and repair. Only then can we crack out the supplements. In the mean time make sure to take the first steps to improving your hormone profile by reading 7 ways to boost your fertility naturally. And make sure to listen to the podcast that I did with Dr. Nora Pope for the full rundown! Now I want to hear from you! 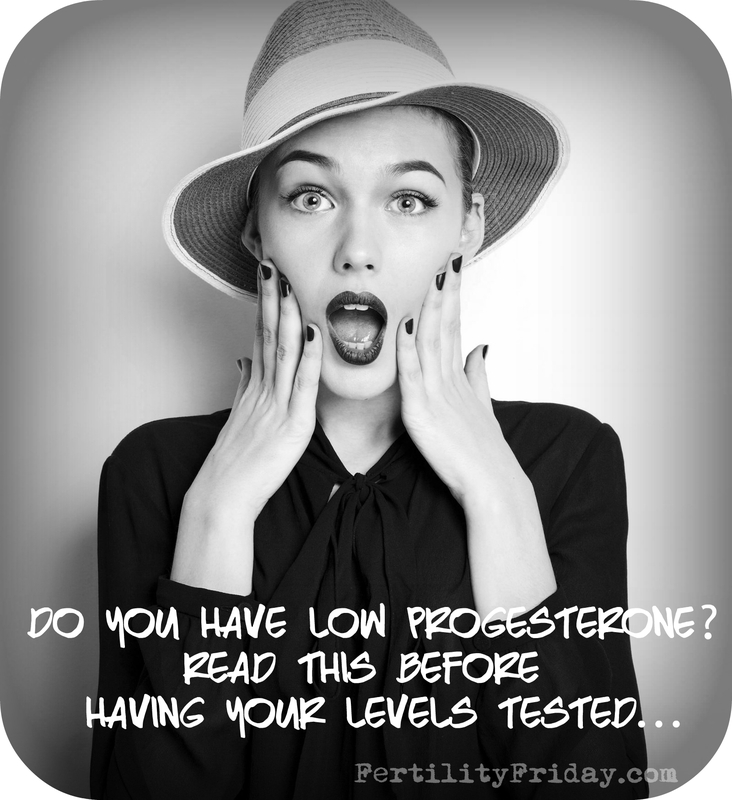 Is your progesterone low? How do you know? Have you been tested? After reading this article, was it done at the right time? Please share your experience in the comments below! Hi Lisa, you may want to get your progesterone levels tested for confirmation. It’s hard to know what could be happening in your cycle without actually seeing your charts. I’ve always suspected my progesterone levels are low bc around two weeks prior to my cycle starting my sleep goes haywire. I have always struggled with sleep issues, but it consistently gets really bad right before I start and then improves (relatively). I’ve been meaning to get it tested, but I have yet to consistently track bbt. This is a very helpful post! Thank you! My OPK suggested I was due to ovulate on day 21/22 this month but GP insisted on testing my hormones on day 21. Progesterone showed as very low – 2nmol/l and whilst this is probably abnormally low regardless of the date, I still think they took it too early to give me accurate results. I will ask for another test on day 28! I would be beyond grateful if you could reply to my comment. It’s probably unusual question but I have small breasts. My mother and grandma have E/F sizes and they used to be barely A before pregnancies in their 20s/30s. I talked to them and they had similar issues as me (obviously they didn’t test their hormones when they were my age). Do you think their breast growth may be associated with their hormones balancing during pregnancies? And if so, is it possible that if I would balance my hormones my breasts would grow? Hi Cat, if you’re looking for specialized support, take a look at my program offerings. Also have a listen to this podcast episode about finding a practitioner who will support you. My doc said I have very low progesterone (.02) but she tested on day 6 of my cycle? Hi Cg, a progesterone test is only useful post ovulation. By day 6 you hadn’t ovulated yet. Have a listen to this podcast episode (here). This was extremely helpful. I had a miscarriage in May of this year, and it has taken a couple cycles for my cycles to become “normal” again. I have been charting for over a year, and my luteal phase is generally 12-13 days, but recently, I had noticed that post O, my CM wasnt drying up, and I was also missing pms that I had before (sore breasts, cramping, etc). I saw my dr, she did an ultrasound to make sure everything was healthy post MC, and luckily I had ovulated 4 days before the ovulation (according to my BBT. I started using clearblue fertility monitor this month, but it gave me “high” results for about 10 days, before showing “low” which showed the day after my temp rise). But, the ultrasound showed the ovulation had occured, and I had my levels tested at 9DPO. My levels came back at 3ng, which she said are low. I have an appointment with her in a couple weeks (holiday season is packed apparently! ), but I have been looking up more things, and have been told that low progesterone is not a diagnoses, but more a sign that something else is wrong. Is this correct? Everything I have read indicates that low progesterone is a hormonal imbalance, and not directly showing that something else is wrong and I need more tests (the person whom said this recommended other diagnostic test such as CD3 blood work). I want to be well equipped with knowledge and questions on where to go from here when I have my appointment. Any advice would be beyond appreciated! Hi Britt, for support charting your cycles, and interpreting what’s happening in your cycles, consider joining one of my programs. Also, seek the support of a functional medicine practitioner to help you identify the underlying issue that is causing your symptoms. I had my Progesterone tested on cycle day 21 and it came back at 11.7 (Ovulation phase). I had my first Peak result on OPK on cycle day 15 of this month. Would that suggest I do ovulate on cycle day 15 or 21? ? ? Hi, I have been trying to conceive for a year now after coming off the pill. I have been experiencing dark brown spotting anything from 4-7 days before my period starts. Had my progesterone tested in the summer, first test was borderline & 2nd was positive for ovulation but spotting still continues each month… Had a pelvic scan which was all normal. Any ideas as to why the spotting? I realize that I am kind of jumping the gun here, but my husband and I have been doing Natural Family Planning/Fertility Awareness method for almost 17 years and my luteal phase is always 13 days. My 7th child (all 7 babies were planned btw) is 19 months and I finally had my first ovulation a week and a half ago! (He’s a passionate breastfeeder). Prior to his pregnancy, we miscarried twice due to low progesterone, which was discovered by my midwife very early on in his pregnancy. I have made some diet and exercise changes since then hoping to get my body back on track, but my luteal phase after ovulating for the first time since baby #7 was very short – about 8-9 days, so I’m already 3 days into my first period. Kind of bummed and want to be on top of this issue. My fertility doctor asked me to take an ovulation test. Once the test was positive I was instructed to have my pergesterone level 7-9 days after the positive test. I was tested in day 9 and my result was 4.4 ng/ml. I was also told if I didn’t get a positive ovulation test that I could go on day 21. My progestrone was 1.4 on day 21 and my doctor said this is positive for PCOS but i didn’t start my period until day 31. I told her I thought the test was done too early but she said nope the 31 day cycle was consistent with PCOS.